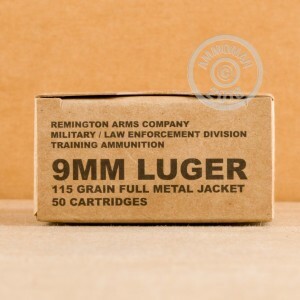 Remington's 9mm ammo is a great option for general range work, plinking, and weekly IDPA club matches. This particular ammunition is part of a contract overrun of police and military training stocks which is now available for public purchase. Shooters can expect the reap the benefits of great production value alongside tight quality control checks which all take place at Remington's factory in Arkansas. 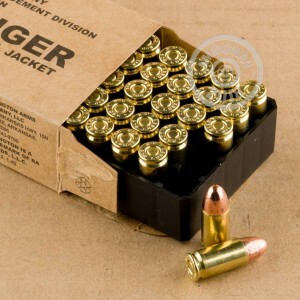 Build components consist of fresh brass casings which can be reloaded after firing along with non-corrosive brass cases and fully consumptive powder. Each round launches a 115-grain full metal jacket (FMJ) bullet which possesses a rounded nose and hard copper jacket. The jacket cuts down on copper fouling for greater accuracy and less frequent cleaning while the curved profile encourages smooth, reliable feeding in multiple types of guns. 115 grains is light, but common, for the 9x19mm caliber and offers manageable recoil impulse alongside a flat trajectory that even the most novice shooters can learn to compensate for out to typical handgun distances.